Black Marble plaques are laser engraved. When the marble is etched the text or picture appears as a frosted white on a black background. 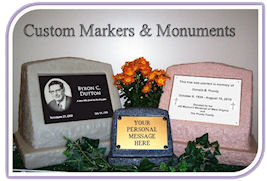 This is a piece of polished black marble tile cut to fit your monument, inscribed with your epitaph or picture. This material works great with black and white photos. If color photos are used, they will be converted to black and white before engraving is done. This is a more permanent plaque and fits nicely into our monuments.